The large 500-wire telephone cable between Stockholm and Gothenburg was buried into the ground during the early 1920s. To allow for a good connection and additionally to connect local municipalies along the way, so-called Repeater Stations were built – from Jakobsbergsgatan in central Stockholm – with about eighty kilometers intervals. 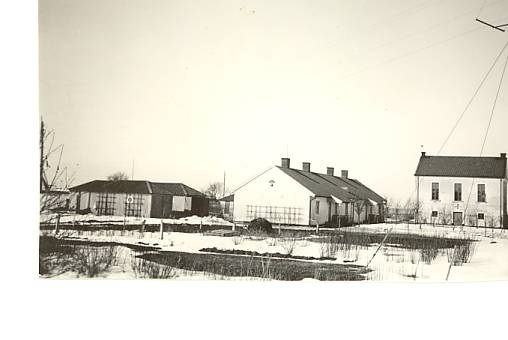 The repeater stations in Västergötland were Lyrestad, Gudhem and Alingsås. The operation of these stations started in the fall of 1922. The main connection to the Stockholm-Gothenburg cable in Gudhem was, of course, the slightly smaller Jönköping cable, often referred to as the “water pipe”. This cable was hanging on poles and was very vulnerable to lightning which if nothing else caused holes in the lead sheath, leading to water leaking in with short circuits as a result. Each repeater station was responsible for the maintenance of the cable and the attached “docking housings” placed under the road and countless are the call-outs made to places such as Kättilstorp to measure the cable between Gudhem and this “docking house” measuring where the cable fault lay. With delicate instruments and proven experience the leak could be located, cable dried and wiped out and new lead casing be applied. The Gudhem Repeater Station’s brain was the so-called cross connect, a mastodon with thousands of threads that ran about and moved as the need for links were changed. The cross connect was central to the area upstairs. All to the house incoming wires were fused in large fuse panels, which during lightning storms sprayed glass splinters – we stayed away! I experienced once a ball lightning which carved ten-meter long black streaks in the polished floor before disappearing via a lightning earthing rod. All wire connections went past the Examination Desk, where measurements could be carried out and where the service connections with the other stations existed. Service connections existed even as far away as a London, England; the talks were limited as far as I remember to “Yes box, allright” – sometimes with negation instead. The station’s other task was to amplify the signals that came in each cable, ie every call and every other signal coming through the cable got an energy boost to their journey further down the road. All to improve audio for the callers. Each voice connection required two threads, which normally would allow 250 calls simultaneously on the cable between Stockholm and Gothenburg. By using transformers and so called inductors, roughly 500 connections could be established and used simultaneously. This technology was American and was installed as far as I know by American engineers when the station was built in the early 1920s. Someone from Gudhem may remember if there were any visiting foreigners at the time. 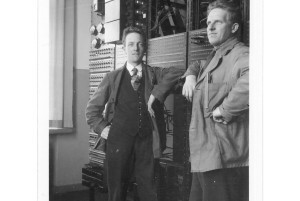 Upstairs, besides the cross connect were amplifiers and also a couple of offices, a small workshop, and once the telephony traffic was automated in Gudhem, a subscriber station. On the lower floor was a large hall of batteries. Upon loss of power these batteries provided electricity for up to 24 hours of operation. In the room next door were the generators with large flywheels that guaranteed a seamless transition from Vattenfall grid electricity to the batteries. Another hall originally contained a hot bulb engine connected to a generator. The huge engine, started with a giant blowtorch, charged the batteries when the grid electricity was not available. This historic engine was then replaced with one of Volvo’s large marine grade diesel engines. 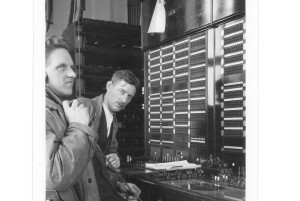 Technology developed over time and and during the late 40s LME (now Ericsson) installed amplification equipment that managed eight simultaneous calls plus a number of other signals on the two wires, ie a total of more than 2,000 connections. However, this required additional amplification and small substations were built; for Gudhem, one in Eggby beyond Varnhem and one in Hällestad on the other side of Floby, ie about two kilometers apart. There were many call-outs, often in the middle of the night when emergency backup generators refused to start. 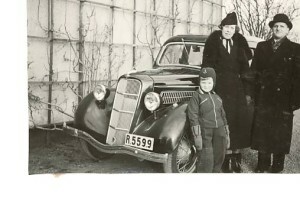 It was on these trips I learned to drive a car while my father reviewed the measurements that were sometimes carried out prior to departure. During the early 50s a new cable between Stockholm and Gothenburg was laid, involving new technologies; the coaxial cable had arrived. The coax contained four centimeter-thick tubes and each such “wire”, could carry about 960 calls simultaneously. This capacity later doubled, totaling more than 10,000 simultaneous connections between the two major cities. It was also fascinating, I thought that this cable was under pressure using air tanks to stop water from entering eventual hole in the lead sheath. Using this system, you were able to determine where the hole was, which now appears somewhat odd. Gösta Frank will correct me if I’m wrong! Within another fifteen minutes the fire brigade from Falköping was in attendance and began to set up supporting stakes in the ground floor. An hour later the complete district office arrived and started installing permanent reinforcement. Don’t say nothing ever happens in the country! A few years after the coaxial cable was introduced, the station building was extended to house an automatic switching facility, a new era that by course was followed by fiber optic cable and so on. However, this took place after I left Gudhem. In the latter part of the world war, within geographical proximity the armed forces built a teleprinter facility. My father was chief engineer also for this technology. We children from “the cable” were obviously very interested in the building. When it was introduced, we were however excluded, which we did not appreciate. We “haunted” the building through the ventilation ducts etc. ; we made noise until the signal sergeant from Karlsborg, defending the 30 women’s voluntary defense staff, came rushing out, wildly firing his semi “comrade 40” ie, service weapon. We were terrified, we did not know then that he shot up in the air. That he did shoot up in the air, he told me though, when I 30 years later met him at Karlsborgs air wing. I had during my time at the Airforce’s First Flight Squadron Headquarters in Gothenburg during the 70s reason to “in service” visit the facility and was then welcome to enter. The plant is now replaced by more modern technology. The station originally had large windows, which during the war was protected by mounted fragment protection. Later, the windows were reduced down to today’s narrow crevices. The penthouse, a paradise for us young people, with all the discarded equipment could only be accessed via the wall fixed ladder or a rope elevator. A visit was always rewarding, not least the breathtaking views from the roof hatches that sits about 18 meters above the ground. You could spot numerous of surrounding steeples from up there. The station building is situated right at the transition between the Mösseberg hillside and the flat landscape paddocks. 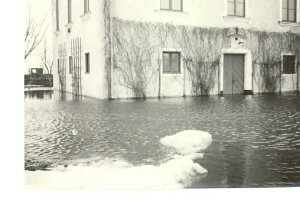 This meant that every spring when the snow melts – before drainage was installed, masses of water came down on the pitch in front of the station house and penetrated the ground floor. A home made bar with sealing bicycle tubing was installed in the doorway and a bilge pump was working inside. Us kids thought this was very exciting, knowing that there was considerable force in the electrical systems inside, a proper bang could be expected when the water levels rose. Thank God we never experienced such short circuit. 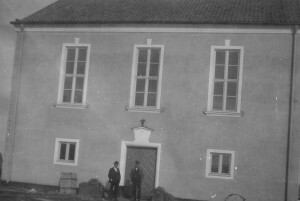 The station was supplied with electricity through its own transformer station which was also heavily exposed to the circulating thunderstorms between the hills of of Västergötland. The residential building consisted of four apartments. A three room apartment for the Chief Engineer’s family and three two room apartments for the repairmen and their families. The apartments were typical 1920s apartments with dry toilets, wood stoves and tiled fireplaces. Brown-black wallpaper was perhaps the epoch standard or set to last for several generations of tenants. The apartments had despite its small size both an impressive kitchen entrance with patio and a formal main entry with patio and seating. The apartments were modernized in the 1940s with central heating and hot water from the station added. Electric stove and water closet also showed up eventually. When the family Ljungström grew to a fifth family member, their two room apartment was extended with one room, which later became a guest apartment for temporary duty repairmen. The rent for apartments was initially low, until central bureaucrats came to raising it sharply. 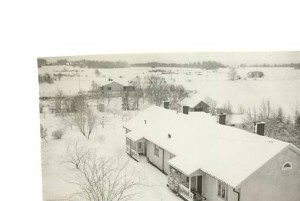 This meant that new repairmen often preferred to rent at Grågåsen, or to commute from Falköping. This is possibly one of the reasons why the house is now demolished. Each apartment had a large granary belonging to it in the northern end of the building. There was also the laundry room and the large communal bathroom, with, as I experienced it, a giant bathtub. 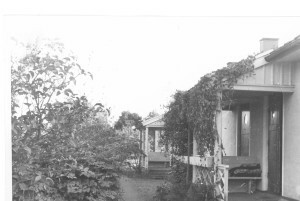 At the southern end of the building, contiguous to the garage of the service car, each apartment had its woodshed, with a throw-hatch from the woodpile behind. 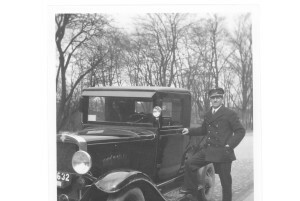 Service Vehicles consisted at first of a motorcycle with a sidecar for utilities, followed by a Chevrolet with flatbed and solid rubber tires, a Volvo truck, a Bedford van – far too small – one of the larger Ford trucks, a Volvo Duett, followed by another, etc. The war time vehicle gas units proved to be too slow and time-consuming for 24 hour a day emergency operations. The unit was removed and the vehicle was started on gasoline and were then driven with an alcohol derivative. This was possibly a very early green “environmental adaptation, combined with sport” implementation, because the engine became so weak that it was required of the passengers to get out and push the car at the steepest hills. A small house next to the garage housed all the equipment needed to make repairs along the “line”, ie cable faults. 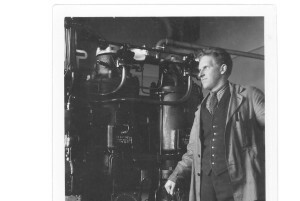 There were spits, crows, shovels, paraffin boiler machine, acetylene heaters to drive out moisture from the cables as well as new lead sheath with tin rods for brazing. In the rear of this house was the bike hut where private bicycles, but mainly the yellow service bikes were parked. Further south on the large plot was the chicken coup! I recall experiencing hens cages but can not remember that they harboured any chickens, it was probably before my time. In contrast, the chook house kept an impressive collection of air assault protection equipment, as well as our Ford Anglia, sitting on stumps as the tires were “donated” to the Defence Forces. On the other side of the creek, near the border with the neighbor, manager at the Gudhem Kungsgård, was a playhouse with all outdated facilities, a delight for us children. 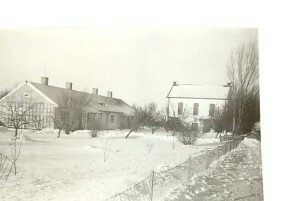 We often lived there in the summer, cooking on the stove until one day it broke, and had very nice time. The plot is very large, which gave the opportunity to plantations, which basically made the families self-sufficient in potatoes, vegetables and fruit; wild harvested lovely cherry trees, about 35 apple, pear and plum trees provided us with fruit. These trees were cared for tenderly and gave great harvests. Flower-beds surrounded the large lawns. The Royal Postmasters Office organised competitions between their repeater stations with the finest gardens. The constant on-call service provided – when no technical faults hindered – labour for gardening and wives usually had the time and interest to develop its splendor. When the Gudhem Repeater Station won the award three years in a row, the competition was closed down. Prize money, which went to plant purchases, however, kept coming. The station normal operation and minor continual technical alterations was run by three employees. 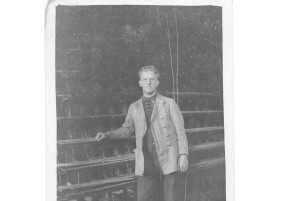 The Chief was a line foreman, later renamed the Station Master. 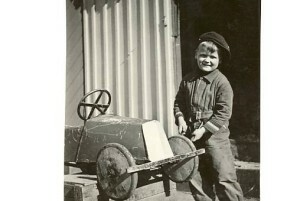 At his disposal he had a First Repairman and a Repairman. Major new installations were implemented by visiting telecommunications engineers. The three permanent employees shared the 24/7 on-call service. Since almost all lived in the area, it was no problem to pull in the entire workforce as required. With the help primarily of church records I have made ​​a compilation of the employees until the I left Gudhem and beyond that have received input from Gösta Frank. Auxillary work, such as cleaning, (we hade very well polished floors!) and to every morning ride up to Grågåsen to get the mail at Norbergs, later Ingerhages, was shared on a monthly basis between the three wives. During the war, it was especially important that the connections functioned flawlessly. The Repeater Station was protected, as previously mentioned, by the mounted fragment protection. All timber was painted with a special solution that made the wood fire retardant and firefighting capabilities were very well developed. The permanent staff was freed from other military service but were included in the Armed Forces Site Protective Services. A platoon of army infantry was placed on the station for protection. As today’s Home Guard, the platoon was recruited locally. At harvest time, it was sometimes troublesome for these soldiers but with nice cooperation by those who were not farmers helping their friends, I think it resolved to satisfaction. My mother catered the platoon. It had among others the advantage that there was never a shortage of food. Supplies were delivered from the regiment in Skövde, rationing coupons were never needed! The advantages of the station being located in the country during the war were great; Friends all around, not least the infantry men, ​​often brought home fresh hare. The milk never ran out from Frankenbergs down the hill – it was my effort during that time, to fetch the milk after the evening milking. To get additional food, rabbits were bred in large cages south of the creek. I myself was entrusted with a rabbit. When it was fully grown, it would be slaughtered, which I refused to accept. However, I agreed that it was sold. My father solved the problem! 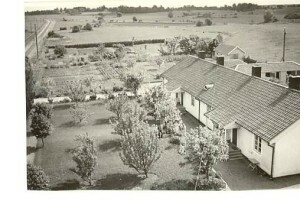 The – for the times – high-tech facility was located in a rural area, positioned with large paddocks on three sides. Few people around knew the station’s purpose, only that it had something to do with “cable”. Access was not allowed, and this prohibition was maintained relatively strictly. The infantrymen surely shared many stories as they obviously were admitted to the premises. They had their entrenchments in the roof, the windows, etc., and practiced frequently. The infantry regiment in Skövde was quite often looking to test the vigilance and “attacked” across the pastures. In the community though, it was understood however, that if they had electricity or telephone technical problems, there were skills available at the “cable”. One should not forget that regular electricity and telecommunications engineers were usually called in and found himself in an unknown location. If the control system for the boilers at Bjurum distillery broke, it was disaster and a message was sent to the “cable”. 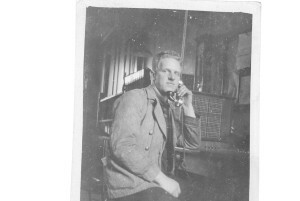 If the telephone line broke at the person who sold eggs, it was temporarily fixed until a linesman from Falköping had the opportunity to visit. 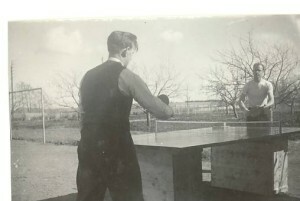 Association activities were extensive, with a sewing circle, the Red Cross (during the war directed toward the soldier in the field), Youth Red Cross and the women’s voluntary defense staff. The ecclesiastical activity was not extensive probably due to the sharp Schartuan focus driven by a group of ladies. It was only when the Vicar, who later became Dean, Fägerlind eased up the view of the Christian activities, the bonnet wearing, fully dressed in black, older ladies in church on Sundays no longer could act as a disapproval barrier for the other parishioners. The Remount Training School and Depot, was of course an asset with its 500 horses. I was a trend rider at a pretty young age and had the pleasure to exercise the depot manager and his closest men’s service horses. Sonnau, an ancient Olympian winner, loved to jump even as a 18-19- year old! 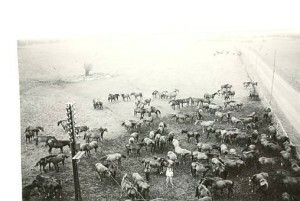 The depot had deposited a dozen halters at the station, because the Remounts now and then broke out of the paddocks. In the evening, hundres of horses in the paddock would gather and work up a fierce momentum. If the lead horses aimed poorly, the wood fence did not stand a second against the trampling horses who went straight through. 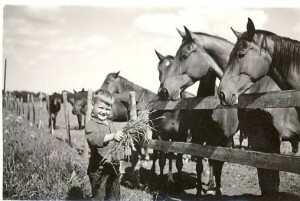 Many a summer evenings we mobilized everyone to gather horses, walking loose on and along the roads. The traffic was not so dense in those days, so the evening bus just had to take it easy through the herd of horses. 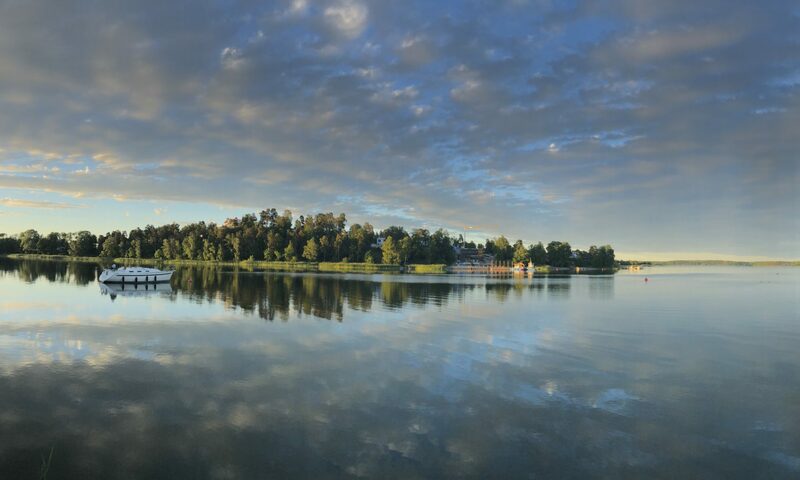 Somehow it felt like Gudhem was a central point, it was situated at biking distance to everything you needed to visit – Falköping, Skara and swimming in Slafsan in Broddetorp, it was a quiet and carefree time!